No one can dispute the fact that Professor Govind Sadashiv Ghurye is the founding father of Sociology in India. Even in the last decade of his life when he was over eighty years old, he continued to make his intellectual presence felt as an incisive social thinker, highly innovative and equally at ease with Vedic India and contemporary India. On his return from Cambridge, where he wrote his doctoral dissertation under W.H.R. Rivers and later A.C.Haddon, Ghurye succeeded Sir Patric Geddes as Head of Department of Sociology in the University of Bombay in 1924. He continued to head the Department until his retirement in 1959. After retirement, he was designated the first Emeritus Professor in the University of Bombay. Thus, besides his own outstanding achievements in the field of sociological and anthropological research, Ghurye became internationally known with his clear half a century's record as a post-graduate teacher. With his inspiring leadership and guidance, Professor Ghurye produced a generation of great sociologists some of whom are household names in the field of sociology today, like M N Srinivas, I P Desai and K P Kapadia. Thus while developing himself as a sociologist, Ghurye was also supremely conscious of his role as a teacher, a 'Guru' in the best of Indian tradition. Kindling the research interests of his colleagues and students was part of his self-chosen and self-imposed duties. Ever conscious of his 'pupil coverage', he attracted brilliant students from different corners of India. He expected them to work like him and gradually created an academic milieu in which writing a paper or a book came to be looked upon as a very natural thing to do for all research students and staff members. In the concluding paragraph of his autobiographical account, Professor Ghurye has written 'So far 80 dissertations have been successfully completed and accepted by the University for appropriate degrees, 25 for the M A. and 55 for the Ph.D. Of these 38 have been published as books and one is in press'. Very often Ghurye helped his students to find out publishers for their works and this was highly necessary and relevant at a time when sociology had neither substantial government support nor private munificence. Ghurye's contribution to the development of sociology and anthropology in India was enormous and multi-faceted. A Brilliant scholar in Sanskrit, Indology, Anthropology and History, his invaluable and original contributions to the sociological literature on a wide range of subjects both Indian and foreign, were based on profound scholarship, painstaking research and lucid analysis. A prolific writer, Ghurye wrote 32 books and scores of papers, which cover such wide-ranging themes as kinship and marriage, urbanization, ascetic traditions, tribal life, demography, architecture and literature. He has rightly earned a place with world famous social scientists like Rivers, Morgan and Maine. 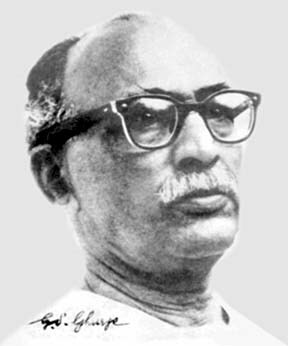 Ghurye played a key role in the professionalization of sociology by founding the Indian Sociological Society and its journal 'Sociological Bulletin'. In addition, as noted earlier, he encouraged and trained a large number of talented students who, in turn, advanced the frontiers of sociological and anthropological research in the country. With his own voluminous output and through the researches of his able students Ghurye embarked on an ambitious project of mapping out the ethnographic landscape of India. Let me now turn to the great works of Professor Ghurye. In my view Professor Ghurye's greatest work was 'Caste and Race in India' which was published in England as a part of the History of Civilization Series edited by C.K.Ogden in 1932. For 76 years, this has remained a basic work for students of Indian sociology and anthropology, and has been acclaimed by teachers and reviewers as a sociological classic. The relationship between caste and politics, which he had briefly dealt with in the 1932 edition, was subsequently developed in a more detailed manner in the 1969 edition. In this revised edition, Professor Ghurye came out with a provocative and thorough-going analysis of caste and politics in Tamil Nadu from early times to the present day. In the concluding chapter of this great work, Professor Ghurye gave an incisive analysis of contemporary India and rightly apprehended in 1969 that India will develop into a plural society and not a casteless one, which was a dream of the architects of her Constitution. Closely linked with the study of Caste was Professor Ghurye's well-known analysis of the Scheduled Tribe problem. His anthropological inclinations naturally brought the tribes close to his heart, and a start was made when one of his pupils studied the tribe of Katkaris in 1930. Other pupils followed it with studies on the Warlis and Agris, all of them on the Western coast, quite close to Bombay. Inspired by the work of his students, Professor Ghurye wrote on the grand theme of 'Integration of Tribals' in 1943 and it was essentially in reply to the 'isolationist' approach of Verrier Elwin, which formed the basis of the British colonial policy. Professor Ghurye viewed that the only solution to the problem was their progressive assimilation with the farmers and peasants of the adjoining districts. He had the vision to conclude that the major problems of the tribals were never different from the problems of poor rural people in general. In the subsequent editions of the book 'The Scheduled Tribes', Professor Ghurye was critical of independent India's government policies which sowed the seeds of disintegration by its internally contradicting steps of laying down the integrationist approach in the Constitution and on the other hand promoting fission by giving importance to the idea of Scheduled Areas. The comprehensive manner in which Ghurye studied the problem 65 years ago led to a methodological contribution as well. In the words of Dr. N.Datta-Majumdar, he raised the study of the tribals from the pure plain of Anthropology to that of Sociology. Professor Ghurye published a study titled 'The Mahadev Kolis' in 1957 based on field data from three districts of Maharashtra. This was the first major attempt to deal with a problem at the micro level. The kind of attention he paid to even minor details of the life of the Mahadev Kolis brings to life the ethnographer in him but he is not lost in ethnography, for the mould into which he casts his material is sociological. We can easily see the stamp of this approach in other studies done under his guidance: the Coorgs, Thakurs, Newars and Meities at different periods. The study of the Coorgs by M.N.Srinivas, sub-titled 'A socio-ethnic study' became internationally famous. Ghurye's basic concern with social process, culture and civilization led to his writing three books dealing with some aspects of these themes. The first book, 'Social Process' published in 1938 reviewed the topic in the light of a century of sociology since August Compte christened it so in the fourth volume of his great work, Philosophie Positive, published in 1838. Nature, the well-known scientific journal of London gave an abstract of Ghurye's book in these words: 'Social Process, Ghurye considers, has two aspects: the nature of Cultural Development as reflected in the trend of thought about man as a living entity, and the process by which the individual is assimilating into the cultural flow of the times' Scientifically, proper planning of a good life must rest on the understanding of life, and the psychological study of the individual and society should precede the study of man as a political and moral being'. The comparative study of ancient civilization and culture Ghurye thought was a required background for students of sociology, and he instituted a compulsory paper on it at the M.A. level. His own views led to the publication of his second connected work Culture and Society in 1947 in which he discussed the difference between civilization and culture. He said, 'Culture is what we are; it is the individual's participation or cultural endeavour that makes the collective enterprise called civilization possible'. In 1949, he published his third book titled Occidental Civilization. The birth centenary of Professor Ghurye was celebrated in a befitting manner by the Department of Sociology in the University of Bombay in 1993-94. A national seminar in commemoration of the centenary year was organized by the Department on November 22-23, 1994. In 1997 a landmark book titled Indian Sociology Through Ghurye: A Dictionary was published. It was authored by S. Devadas Pillai. This volume makes an academic 'journey' through the themes and thoughts of Prof. Dr.G.S. Ghurye. This is probably the first time that an Indian thinker has been honored with a dictionary on the lines of those on Karl Marx, Emerson and others. Professor Ghurye often spoke of the dignity of learning: 'of the need to keep scholarship pure, to protect it from its three greatest enemies: amateurism, journalistic prostitution, and obsession with doctrine'. Yes. He was a great Sociologist. Proud f his works..an amazing sociologist from our country that is more f a gr8 thing????? ?